If you're deciding whether a shipping container structure is right for your business, you probably have some questions. We offer a large selection of resources ranging from fast introductions to in-depth, industry-specific guides. If you can't find what you need, you can always give us a call at 877-704-0177 or contact us online. Our shipping container structure experts are always happy to talk to you. 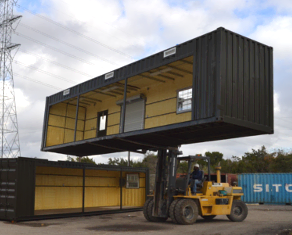 Get exterior and interior dimensions and other specs for common types of shipping containers. Compare field-tested solutions for storage, office space, living space, and industrial enclosures. Learn how your modified shipping container structure will be delivered to your site, and how you can relocate it in the future. Take an in-depth look at your container structure options with our eBooks and webinars. We cover key topics including coding and permitting, basic design guidance, and industry specific applications. See what shipping containers have done for other businesses. 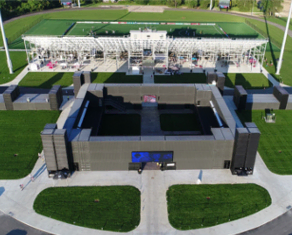 Our case studies range from fast and easy storage to multi-story shipping container stadiums. Do you have questions about shipping containers? You're not alone. Check out the answers to our most frequently asked questions. Why should I choose a shipping container over a brick and mortar building? What site preparation do I need to do? How does Falcon Structures' ordering process work? Can I cut an entire wall out of a shipping container? Each week, we cover shipping container structure news and offer insights into innovative applications. Look through our archives to get a boxpert perspective on shipping containers, and subscribe to stay in the loop.